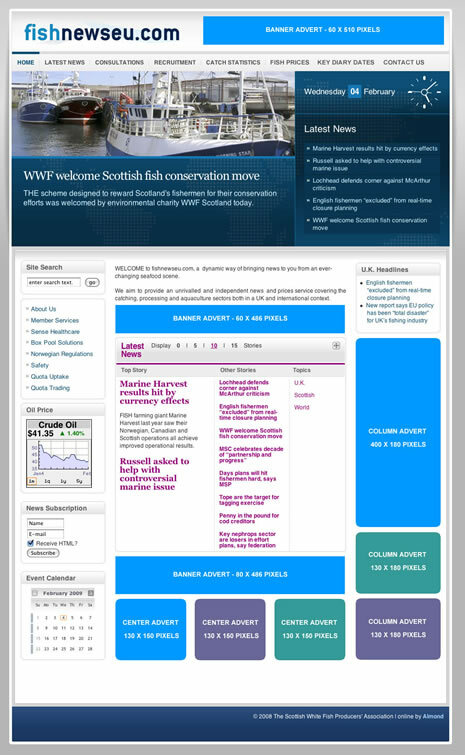 Fishnewseu.com is the only Scottish Seafood news provider backed by a leading industry body, (The Scottish White Fish Producers Association SWFPA). Fishnewseu.com has 12,000 to 13,000 visits per month, with 8,000 to 9,000 visitors accessing around 22,000 pages. These include CEO’s and MD’s within the Scientific and Engineering sectors as well as Politicians and Senior Civil Servants within the EU. Finally, let’s not forget the 1,400 members of the Scottish White Fish Producers Association, who represent the front line of the Fishing Industry. Advertising with us offers you the opportunity to contact key decision makers in the Fishing and aquaculture industries and persuade them to choose your products and services. Advertising rates start at as little as £100 per month and, because of the highly focused targeted readership, offers you minimum wastage of your advertising budget. Contact us now to discuss in more detail.